Anthurium redolens Croat, sp. nov. TYPE: Panama. Darien: NE slopes of Cerro Sapo, approach from Garachine, 2,500 ft., Hammel 7235 (MO 2815433, holotype; PMA, isotype; Live at MO). Planta epiphytica; cataphyllum modice membranaceum persistens reliculo fibris tenuibus; petiolus anguste obtuseque sulcatus, (3-)5-19 cm longus; lamina subcoriacea, oblongo-elliptica, basi acuta, 26-44 cm longa, 4-9 cm laia, pagina inferiore nigro-glanduloso-punctata; inflorescentia erecta ad eflusa; pedunculus teres, 30-48 cm longus; spatha viridis, membranacea, lanceolata, 3.5-8 cm longa, 0.7-2 cm lata; spadix lavandulus, 7-13.4 cm longus, stipite usque 3 cm longo, aromaticus sub anthesi; baccae rubrae, 6-7 mm longae. Epiphyte; stems short, 1.5 cm diam., roots moderately thick, green, descending; cataphylls moderately thin, 5-7 cm long, acute and apicu-late at apex (the apiculum 3-4 mm long, often curved), drying reddish brown, promptly weathering into fine, more or less loosely reticulate fibers. LEAVES erect or erect-spreading; petioles (3-)5-19 cm long, 4-8 mm diam., narrowly and obtusely sulcate, rounded abaxially; geniculum 1.5-2.5 cm long; blades subcoriaceous, oblong-elliptic, gradually acuminate at apex, acute at base, 26÷44 cm long, 4-9 cm wide, usually broadest at the middle; upper surface matte, lower surface semiglossy, densely black glandular-punctate; midrib convexly raised above, sunken toward apex, prominently raised below; primary lateral veins 7-15 per side, departing the midrib at 30-45° angle, straight to collective vein, sunken above, raised below; interprimary veins scarcely visible; collective vein arising from the base, 5÷7 mm from the margin, sunken above, raised below. INFLORESCENCE erect to spreading; peduncle 30-48 cm long, 4-6 mm diam., terete, 2-9 times longer than petiole; spathe green, thin, lanceolate, 3.5-8 cm long, 0.7-2 cm wide, broadest just above base, abruptly acuminate at apex, acute at base, inserted at 30° angle on peduncle, usually persisting; stipe 3-30 cm long, green sometimes faintly tinged red-violet; spadix lavender (B & K Purple 6/2.5), scarcely tapered toward apex, 7-13.4 cm long, 6.5-10 mm diam. near base, 4.5-6 mm diam. at apex; flowers rhombic to 4-lobed, 2.5-2.8 mm long, 2.4-2.7 mm wide, the sides usually jaggedly sigmoid, sometimes smoothly sigmoid (rarely straight), 5-8 flowers visible in the principal spiral, alternate spiral not obvious; lateral tepals 5-6-sided, 1.3-1.7 mm wide, the inner margin broadly rounded; pistils weakly emergent, pale green; stigmas linear-elliptic, 0.7 mm long, brush-like with droplets for several days before stamens emerge; stamens emerging promptly from the base, the laterals emerging well ahead of the alternates, pleasantly aromatic after stamens emerge; anthers lavender, held in a tight cluster around pistil, 0.3 mm long, 0.7 mm wide; thecae ovate, slightly divaricate; pollen white. 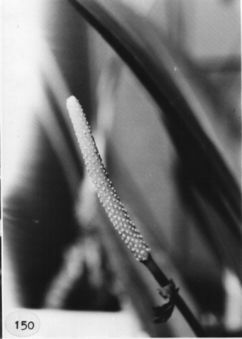 INFRUCTESCENCE erect, to 2.5 cm diam. with berries exserted; berries red, narrowly ovoid to obovoid, acute at apex, 6-7 mm long, 3-4 mm diam., mesocarp somewhat mealy, translucent; seeds 2, creamy white, 2.5-2.7 mm long, 1.9-2 mm diam., 1.1-1.2 mm thick, enveloped in a gelatinous envelope with a short appendage at least on one end. Figs. 149 and 150. Anthurium redolens is found in CoclŽ, Panama and Darien Provinces in areas of premontane rain forest at 500 to 2,500 m.
The species is a member of section Porphyrochitonium and is distinguished by its oblong-elliptic, subcoriaceous, dark green, stiffly erect leaf blades, its obtusely sulcate petioles that are one-fourth to one-half as long as the blades, and especially by its prominently pedunculate, usually lavender to purplish spadix. It is similar to Anthurium hakeri, which dries with the collective vein similarly more prominent than the primary lateral veins, but that species has a more or less sessile, whitish spadix and primary lateral veins that are flat or only weakly sunken on live plants. It also has the lower blade surfaces much paler than the upper surfaces (particularly on dried plants). 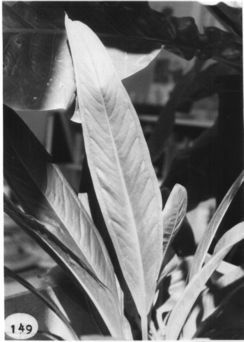 In A. redolens the primary lateral veins-are noticeably sunken on live plants, and the lower surface is not markedly paler than the upper surface. Anthurium redolens emits an intense spicy aroma at anthesis similar to that of A. hacumense, a species that has a spadix of very similar color. The specific epithet redolens (meaning "diffusing an odor") refers to this scent. The spadix of A. bakeri is not fragrant. Anthurium redolens is similar to A. crassilaminum, which also has a purplish spadix but the latter species differs in having a much thicker, usually broader blade with the primary lateral veins scarcely or not at all sunken. Panama Col—n: 250 m, 09.22.30N 79.41.30W, 6 April 1993, Thomas B. Croat 75165 (MO). Panama Darien: 2500 ft.,, , Hammel 7235 (AAU, B, CAS, F, K, MBM, MEXU, NY, RSA, US, W). Panama Darien: 550-830 m, 7.58N 78.23W, 25 May 1991, Gordon McPherson 15394 (MO). Panama Panamá: 300 m, 8.55N 78.31W, 28 Jan. 1984, H.W. Churchill & G. de Nevers 4468 (MO). Panama San Blas: 200-300 m, 9.20N 79.00W, 13 Feb. 1983, C. Hamilton & H. Stockwell 2944A (MO). Panama San Blas: 80-110 m, 09.22N 78.35W, 1 julio 1992, Heraclio Herrera, Benjamin Obladía, Rolando Obladía y Narciso Blanco 1176 (MO).